Greater Raleigh Convention and Visitors Bureau, Capital Area Workforce Development, North Carolina Restaurant and Lodging Association and the Raleigh Convention Center partner on inaugural event. 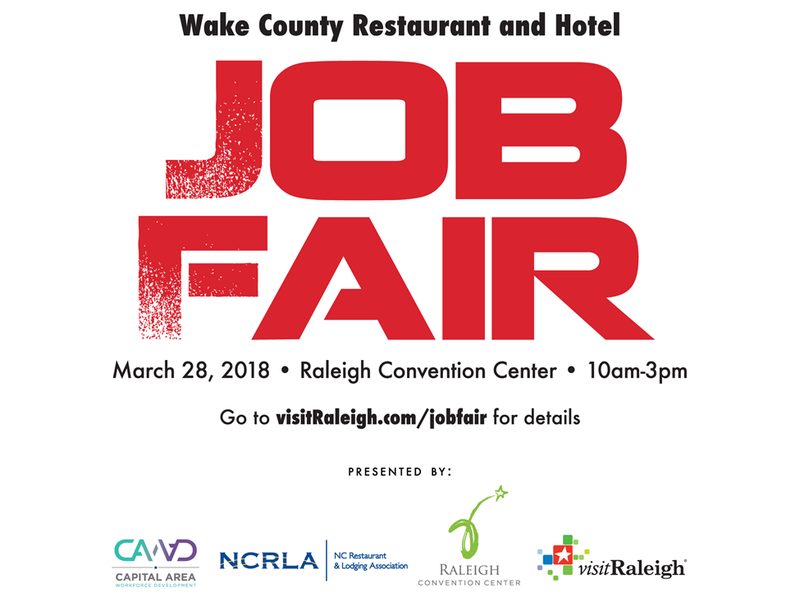 Raleigh, N.C. (March 22, 2018) – The first ever Wake County Restaurant and Hotel Job Fair will take place at the Raleigh Convention Center from 10am-3pm on Wednesday, March 28. The inaugural event is a partnership between Greater Raleigh Convention and Visitors Bureau (Visit Raleigh) and Capital Area Workforce Development, North Carolina Restaurant and Lodging Association and the Raleigh Convention Center. The job fair will feature nearly 80 hospitality industry employers looking to fill more than 3,500 full and part-time positions. Attendance to the job fair is free for job seekers. Vouchers will be provided for free parking at the Raleigh Convention Center Underground Parking Deck. To access, use the entrance on W. Lenoir Street between Fayetteville and S. Salisbury streets. Free transportation is also being provided by GoTriangle and GoRaleigh. Job seekers traveling to the job fair will be able to pull-up on their mobile device and/or print off a free transit pass by visiting GoRaleigh.org/workforce. The tourism industry is as large as it’s ever been here in Wake County with more than 15 million visitors choosing to visit Wake County each year and collectively spending $2.4 billion annually while here. Wake County is home to more than 1,200 restaurants and 150+ accommodations, with another seven hotels currently under construction and 19 hotel projects in the final planning stages. A ribbon cutting ceremony and media photo opportunity will take place at 9:50am just outside the doors of Ballroom A at the Raleigh Convention Center, just before the event opens at 10am. Wake County Commissioner Jessica Holmes will be attending the ribbon cutting ceremony along with representatives from Capital Area Workforce Development, Greater Raleigh Convention and Visitors Bureau and North Carolina Restaurant and Lodging Association. The Greater Raleigh Convention and Visitors Bureau (Visit Raleigh), as the official destination marketing organization of Raleigh and Wake County, accelerates sustainable economic growth and development by increasing visitor and convention business. Raleigh, N.C./Wake County welcomes more than 15 million visitors annually whose spending tops $2.4 billion. The hospitality and tourism industry employs more than 63,000 people in Wake County which accounts for roughly 10% of the local workforce. VisitRaleigh.com. CAWD is a public-private partnership and 501(c)3 funded by the Workforce Innovation and Opportunity Act (WIOA) of 2014. Through collaborations with business, government, education and others, the organization has developed state and nationally-recognized workforce programs, connected businesses to workforce resources and the education system, and helped thousands to gain employment. For more information visit capitalareancworks.com. Established in 1947, the North Carolina Restaurant and Lodging Association (NCRLA) works to advance and protect North Carolina’s $22 billion restaurant, foodservice and lodging industry. The association provides access to the resources and support restaurant and lodging professionals need to lead thriving businesses, while serving as conscientious, contributing members of an unparalleled industry. To learn more information about NCRLA or its membership opportunities and cost-saving benefits, please visit ncrla.org. A three-time winner of ConventionSouth&apos;s Readers&apos; Choice Award, the Raleigh Convention Center is a bustling hub for the culture, commerce and technologies that make the Triangle one of the country&apos;s most admired regions. The modern, 500,000 sq ft, LEED Silver-certified facility includes a soaring street level lobby, an elegant, easily partitioned ballroom, a 150,000 sq ft exhibit hall and a 4,100 sq ft mezzanine as well as cutting edge tech amenities and award-winning culinary delights. Convention center staff also operates the nearby Red Hat Amphitheater and Duke Energy Center for the Performing Arts, which can also be part of an event experience. For more information visit raleighconvention.com.